When I was in grade school, even high school and college, I had such a defined hatred for running. My throat would burn at the very thought of lacing up. It just wasn't anything I was remotely interested in, and I declared myself a non-runner...forever. Why run if I could walk? And I could walk fast enough. But then, I ran. Sure, I may have given it a go in college once or twice because that's what all the cool kids did in between classes, but those measly attempts never trumped my declaration of hatred. It wasn't until post-grad, when I was working full time, that something changed: I became a runner. Why? Because walking was no longer enough. I needed more. And if you can't walk, well...that leaves running (or biking, I guess, but I didn't have a bike). So I sucked it up and started adding in bouts of jogging to my power walks. Jogging turned to running, and power walking went away. I'm a runner. A pregnant runner that can't really run right now, but I'm a runner. I did run a mile yesterday morning (today was a rest day) so that counts. Right? I smile. But seriously, though. 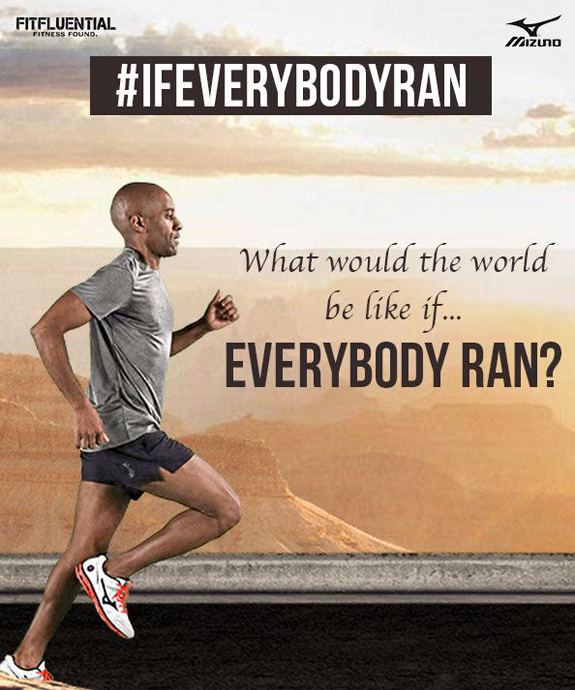 What if everybody ran? That's the question Mizuno is asking right now. • 48,081,000 less cigarettes would be smoked...because running produces a 41% decrease in the desire to light up. • 20 million more great-grandmothers would exist...because the benefits of running can produce more than six extra years of life. • Our memories would be 20% stronger...because that's how much vigorous exercise can boost recall. • There would be 37% more smiles...because exercise is proven to reduce anger by 83%. Can you really compete with that? Of course, there are physical reasons why people cannot run, but I imagine that many don't even try because of the perception that running is hard. And it is, but a good challenge produces the best kind of results. Running isn't always easy, and can often feel wicked bad when you first begin to jog, that feeling never really goes away, but our individual definitions of "wicked bad" change with experience. And for the record, there are A TON of different runners out there. So even if you run a mile once a week, you're still a runner. If you run a few laps in your bootcamp class on a regular basis, you're a runner. Get out there, friends. Run. Question: Do you run? If not...why? Have you tried? Given up? Kept going? Love it now? I wanna know! This is a great campaign. I run for fun. Even though racing isn't my #1 interest, I am still a runner. Kudos to you for running and pregnant! I hope people going by see you and think, "What's my excuse?" Ahh, the treadmill. Runners love to hate it! When I'm on the treadmill, all I can think about is that I'm on the treadmill. HA! Running outside is so much better! The scenery distracts and calms you. Do you take walks? Try putting a few seconds, minutes, blocks...whatever...of running into your walking routine, interval style. The scenery can motivate you, as can some good music! This is how I started, and eventually, the walking turned into running! Love, love, LOVE this campaign from Mizuno.